NOVEMBER 18, 2009 – ROCHESTER, NY – 120 people gathered at the Rochester Museum and Science Center last night for the RRPC / New York Photonics Annual Meeting and a panel discussion about Optics and Energy. Two RRPC members were recognized with awards for exceptional leadership and entrepreneurship. 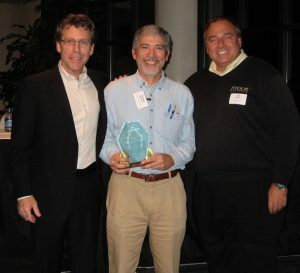 Michael Mandina, President of Optimax Systems, Ontario, NY, is the winner of the 2009 RRPC Entrepreneur of The Year Award. The award is given annually to an RRPC member who has demonstrated creativity, innovative spirit and drive in pursuit of the dream of creating an industry-leading company in the Optics, Photonics and Imaging Industry. Christopher Cotton, President & CEO of ASE Optics, is the winner of the 2009 RRPC Leadership Award. The Award is is given to a member who has demonstrated a passion for working with both fellow members and the community to promote the Rochester Region’s Optics, Photonics & Imaging Industry. Mandina started his first optics fabrication company in 1976 in Rochester at the age of 25. The company, Cormac Industries, started with business partner Warren Carlough, was later sold to Melles Griot in 1980. Today that Rochester company is part of CVI / Melles Griot on Science Parkway in Rochester, employing over 75 people. Optimax began in a barn in Ontario, NY in 1990, moving to a new new facility on Dean Parkway in Ontario, NY in 1997. The company employs 150 people fabricating complex prototype optics for customers and industries around the world. Mandina is a master optician with an Associates Degree in Optical Engineering from Monroe Community College and an Associates Degree in Engineering Science from RIT. He earned his B.S. in Applied Physics from Empire State College and went on to earn an EMBA from RIT. He was inducted into the New York State Business Hall of Fame in 2008. In his introduction to Mandina, James Sydor, President & CEO of Sydor Optics, and winner of last year’s Entrepreneurship Award said, “Mike has now translated his passion for optics and company building into a passion for workforce development and continuing education.” Mandina and his company, Optimax, have been credited with initiating and organizing the Finger Lakes Advanced Manufacturing Enterprise, a workforce development effort whose mission is to build world-class workforce talent that have the skills, inspiration, and motivation to advance the industry, [making Western New York] the most profitable and productive region in advanced manufacturing. 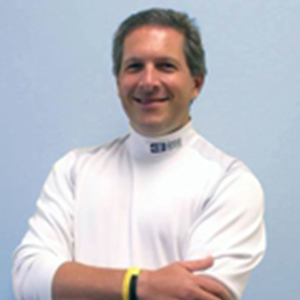 Cotton, President & CEO of ASE Optics, Rochester, is a graduate of the University of Rochester with a B.S. in Physics and both a B.S. and a Masters Degree in Optics. Cotton is credited with organizing the Rochester Regional Photonics Cluster as an industry collaborative in 1998. The organization, which boasts over 70 members, is the largest Optics cluster in the United States and is viewed among industry experts as a model in cluster success and development.